You don’t have to conduct a study to know that people are giving online more now than ever before. Okay, if you really need some numbers, Indiana University and the Lilly Family School of Philanthropy produced the second annual edition of The Philanthropy Outlook last year. The report predicts the trends will continue and donations will increase 4.3 percent in 2017. This is in part due to the above-average growth in the S&P 500 in preceding years and a slight bump in household and nonprofit net worth. With donations increasing, more people must be turning to the web to donate, right? Yep. According to the M+R Benchmarks 2017 Study, overall online revenue for nonprofits increased 14 percent in 2016, with email messaging accounting for 26 percent of all online revenue. Traffic, monthly online giving, and one-time online giving are all up over 10 percent, as well. With online giving continuing to grow at a faster rate than overall giving, nonprofits have a huge opportunity to refresh their websites and develop a strong digital strategy that adheres to best practices as they communicate their organization’s story, mission, and value. Let’s review a few donation guidelines we follow when building our information architecture, user flows, and on-page strategy. Many potential donors are turned away immediately (or abandon the process mid-checkout) due to poor page and site design, which can include clunky structure, slow site speed, cluttered pages, and/or a confusing workflow. As new and recurring donors arrive at your website via email, search, or a marketing campaign, don’t make them click around to give your organization money. This means limiting the fields on your donation form to allow donors to give without logging in or creating an account or entering a dollar amount. Think about all the elements that are being populated on the donation page(s) specifically. Could you remove nav items, ads, promotions, or any other potential distractions? Could you add giving levels? Research shows that limiting distractions and providing suggested giving amounts improves donation form completion and average online gift size. This is the All Hands Volunteers’ homepage. We’ve limited the nav items, highlighted “donate now”, simplified the donation options and fields, and provided a quick way to make a one-time contribution or setup recurring donations. 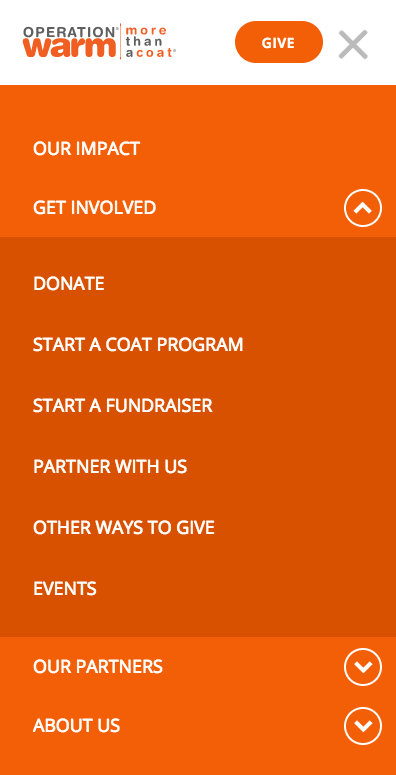 On the Donation page for All Hands, we have expanded the message and pricing options while dropping the top-nav distractions. We’ve also added a list of collapsable FAQs for users to get their questions answered quickly without leaving the page. We get a little tired of talking about responsive design—just because we sound like a broken record. With phone and tablet browsing accounting for over half of the web’s traffic, of course we’re designing for smaller screens. In many cases, we build out the content strategy and wireframes starting from mobile. Operation Warm is another client of ours. Here’s how the website looks on a mobile screen. 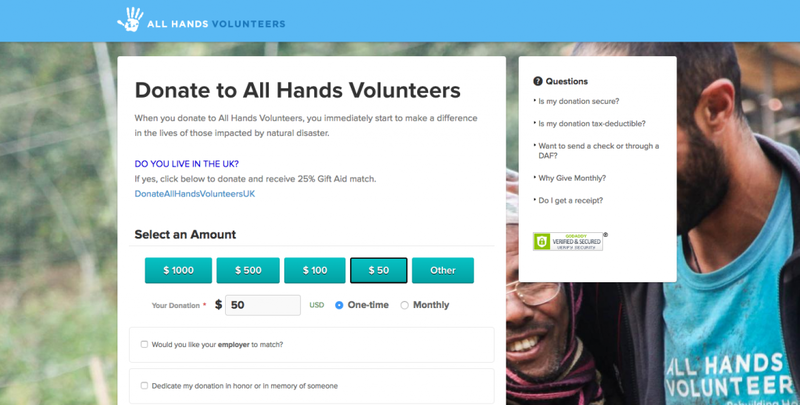 For the homepage, we provided a quick call to action for the user to donate, but also a way for them to learn about their nonprofit validating their organization. As the screen real estate decreases, we prioritize content and messages and begin scaling and optimizing the experience for touch. For the navigation, we’ve kept the navigation simple by adding space between links for easy tapping and dropdowns to avoid taking users to new pages for them to click again. Users can be encouraged to provide recurring donations in a couple of ways. As we’ve shown above, one method is to provide a timeframe option on the donation form to repeat the donation. We’ve opted to provide “One Time” and “Monthly” for many of our donation forms. Another way to encourage repeat donations is to set up periodic email campaigns to remind past donors of their previous impact to reinforce connections. If possible, include images of people (either within the email or pointing users to a landing page) along with direct impact statements (e.g., Your $100 donation purchased three new winter coats for children throughout Michigan). This helps boost previous donors “feel-good” emotions, as well as their confidence in your cause. Okay, your website is easy to navigate and donating money is a breeze. Now that the logistics are tackled, let’s think about your message, story, and mission—and how your website communicates to potential donors. For nonprofits, the most compelling, shareable content is often the most transparent. This is where statistics shine. Anywhere you can put a number to represent your organization’s value or allocation of funds, the better you communicate your impact to potential donors and sponsors. Another way to highlight your organization’s transparency is to spend some time designing and writing interesting content for annual financial reports. It’s an opportunity for potential donors to learn more about your organization’s value and impact, as well as a chance to encourage recurring donors who see the direct effect of their contribution. Essentially, try to think of the report as an opportunity to tell last year’s story rather than simply presenting financial data. If it makes sense for your organization or fundraising event, displaying the amount raised and the effect that money will have towards the cause gives new, more hesitant online donors the confidence they need to join in. You can also use specific numbers to help measure the host of people who have already given (e.g., Join the 34,220 people who have already donated). The deadline should be clearly visible and you could even countdown the days left in the campaign. This is one of the reasons so many donations (33 percent of all online giving) are made in December. Granted, it’s a time of giving, but it also speaks to the human tendency toward procrastination. The deadline for a task directly affects how quickly it’s completed. If you have all year to donate to a charity, then most people will wait until the last minute.